Here is the concept art that was released earlier this year. Here is the exterior today. There are lots of outdoor seating to enjoy the California weather. This quick-service restaurant location received both an exterior and interior make-over. The menu still offers burgers and fries. The new décor and theme pay tribute to California firefighters who go into remote wildfires. These highly trained firefighters are known as “smokejumpers” (Knowing this information helps you to appreciate all the little details that you can find both outside and inside SMOKEJUMPERS GRILL.) The display cases outside the entrance contain these interesting flyers and informational pieces. Here is the interior concept art. Here is what it looks like now. It is worth the time to walk around to look at all the details and smokejumper paraphernalia that is on every wall and corner of the newly remodeled location. 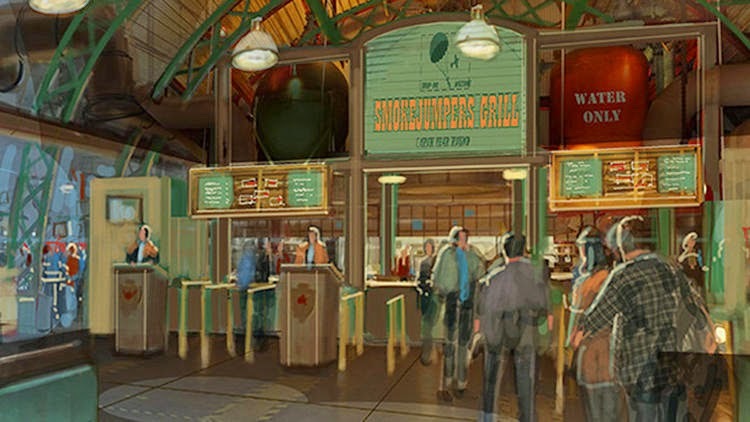 The menu consist of theme park basics of burgers, fries and even alcoholic drinks. There is a kids menu that available, too. There is this condiment bar that has some fancy sliced pickles you can enjoy. Here were some samples of the food offerings. They tasted pretty good, especially if you are hungry. 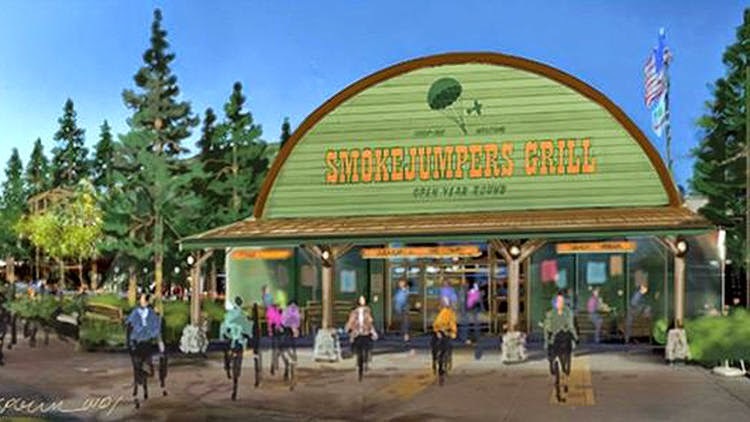 Smokejumpers Grill is a great place to get a quick bite or the perfect late night snack. The portions are easy to share. Lots of seating, too. Finally, here are some of my favorite themed items inside the quick-service location. Outside of this location, you can get a peek at some of the rock work being done for the Grizzly Peak Area. It is interesting to see the work in progress. One final update in regards to the former Luigi’s Flying Tires attraction that opened in 2012 with Carsland. It’s final day of operation was February 16, 2015. 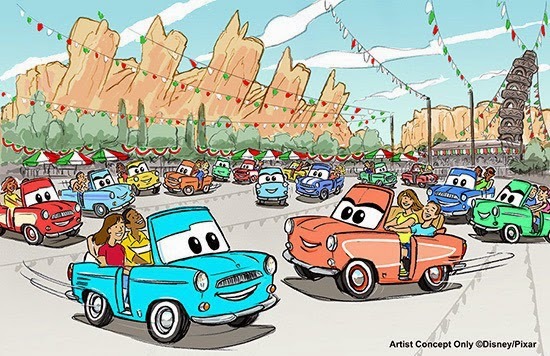 This Disney/Pixar concept art was released earlier this year. “Luigi’s Festival of the Dance” will open in this location sometime in 2016. The name is tentative. The exterior entrance and interior queue is just like the movie so it looks like that will remain as there are no walls around those areas. Imagineers are always creative with their construction signs so I appreciated these on the existing wall that cover up the ride area. I always appreciate all the Disney details in the final work and even in the constant refurbishments that have to happen during Park operating hours. Daisy Sparks grew up in Southern California and Disneyland was a regular part of her life. While in college, she started working at Disneyland as a Main Street Merchandise Host. 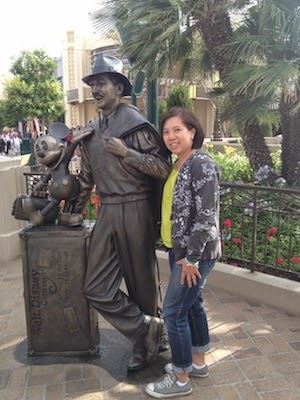 Her "college job" led to 12 adventurous years working with Mickey Mouse. She was a trained Magic Demonstrator, Hat Writer and was even signed off as a Disneyland Monorail Ride Operator. Daisy loved every minute of it while she held various management positions in Merchandise, Business Operations and Attractions. Daisy is married to her college sweetheart, David (a former Jungle Cruise Skipper). David solicited Daisy's Duck's help in memorable engagement proposal that took place at Disneyland's Club 33. Daisy left Disneyland in May 2001 to raise her two daughters. She continues to visit the Disneyland Resort multiple times a week as a Guest. Daisy particularly loves the Disneyland heritage because of all of the little details and stories that make it "the happiest place on earth." You can read more about Daisy's Disneyland adventures over on her personal blog at DisneyDaze . You can find all of Daisy's articles here.